Round four of "The Voice" blind auditions continued last night. With coaches Adam Levine, Blake Shelton, Shakira and Usher having found their groove, the attention was put back on the contestants. Only a few spots remain on each coach's team resulting in fewer buttons being pushed. It wasn't a surprise that former Ford model Audrey Karrasch exuded "stage presence," but her feisty attitude did catch a few judges off guard. The Nevada native got in Shelton's good books when she put Levine in his place for not turning his chair. Her voice, on the other hand, touched Usher. "It takes courage and strength to move this crowd," he told the firestarter who seemed to have already made up her mind. 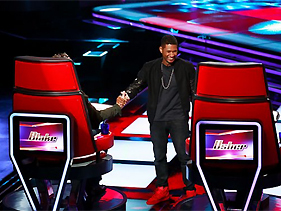 She asked Shelton and Usher what part of the song made them turn their chairs, and as Usher began to respond, she interrupted saying, "OK, Usher let's do it!" Who can blame her? Usher's got that effect on the ladies. Once upon a time, there was a young singer who went by the name Brandon Roush. Not only were his luscious locks a crowd pleaser, but the Kentucky singer also worked with autistic children. The young man caught Shakira's heart in the competition, but also caught the eye of Levine, who could not help but exclaim, "Your hair is beautiful ... You can talk about hair care products together." Before galloping off into the backstage abyss, Roush proclaimed his love for his new maiden, we mean, coach. Hopefully they will win happily ever after. Savannah Berry might have been the youngest singer of the night, but the 17-year-old certainly knew how to play the game. When Levine, Shakira and Shelton turned their chairs, Berry noted Miranda Lambert as one of her influences, then quickly adding the entire panel to her list. The bickering hit its peak when Shakira plead Berry to use her "logic" to choose her, saying of Levine and Shelton: "They're jaded, they're almost deaf." Shelton's charming ways won her over, but not before he offered to adopt her.